This is Part 1 of what will likely be a 3 or 4 part series on a recent trip from Nelson to Kelowna and back. Part 2 can be found here. A pure electric vehicles (EV) with the range of my Nissan Leaf, coupled with the lack of infrastructure in our region, really makes a road trip greater than the range of your EV an exercise in patience. If you can afford a Tesla right now, then this road trip would have been comparatively simple, as you could fairly easily drive the regular speed in winter and make it between public chargers with range to spare. However, for most of us, a 6-figure vehicle is simply out of reach, so if you need to regularly do trips outside the range of the EV you are looking at, you may want to consider a plug-in hybrid electric vehicle (PHEV) instead. In a few years, when infrastructure has filled in and there are longer-range EVs for a reasonable price (see the upcoming 2017 Bolt), this trip will become commonplace and little different than driving in a gasoline vehicle. But for now, a caveat for anyone in a Leaf (or EV with similar range) who wants to recreate my trip (prior to the infrastructure being improved anyways), you simply CANNOT travel the posted speed and expect to make it between each town. I had to drive below the speed limit for every leg of my journey to get to the Okanagan, and the only way to do this safely is to drive at times with low traffic volumes and to be extremely attentive to vehicles as they approach you from behind. Be prepared to yield at any safe pullout so that you aren’t impeding others. The rest of this trip report will focus on the positive aspects of the journey, but believe me, I look forward to the day that the infrastructure is plentiful and the range available on an EV is about double that of my car; I found this to be an interesting experience and rather enjoyed the slower pace at times, but society as a whole just moves faster now and EVs are almost ready to keep up to typical expectations, but not quite there (as of this writing in February 2015). I’d also prefer that a person’s first experience of seeing an EV in the wild is one of wonderment and excitement instead of frustration that they are stuck behind it! 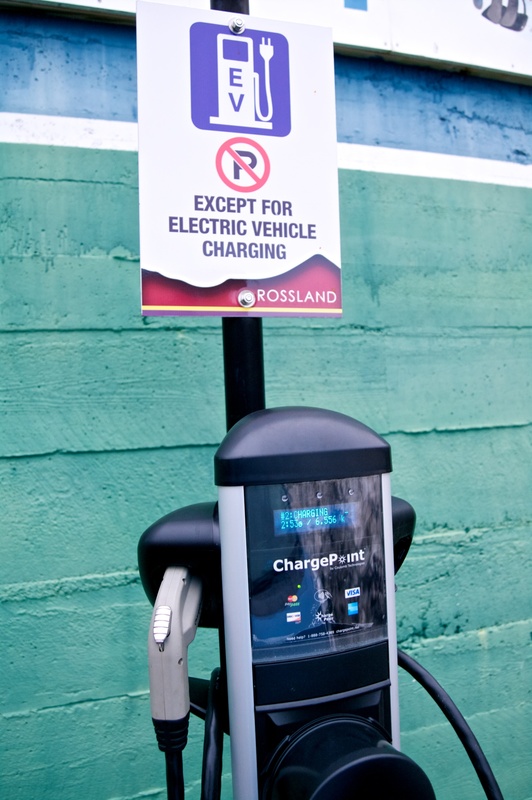 As noted above, infrastructure is underdeveloped in my region, the West Kootenay/Boundary area of BC; we only have one public Level 2 charger, located in Rossland. 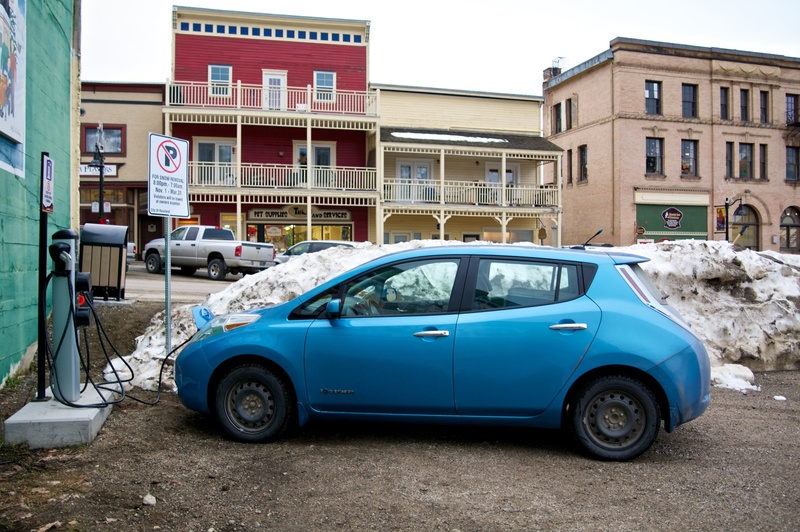 The Leaf gets somewhere between 120 – 140km of range at highway speeds, in summer on relatively flat roads. I was planning this trip for winter (though admittedly a warm one) and had to traverse a number of mountain passes… and the distances I needed to cover were approaching best-case range for the car in summer conditions! Prior to purchasing the car, I had done quite a bit of research online and had came across a forum post on mynissanleaf.com that included energy consumption at various speeds on flat roads, and also included estimates of energy usage to climb a given elevation, and an estimate of energy regenerated to descend a given elevation (link here). The car also uses a base amount of energy just to be turned on (headlights etc), and also uses energy to run the HVAC (this information is available from one of the car’s menu screens). Using all these sources, I put together a spreadsheet to estimate energy usage to travel between two points. 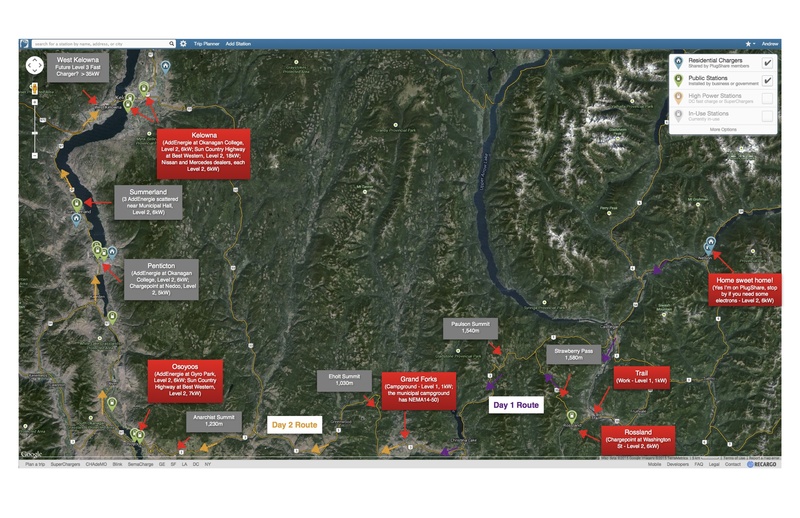 With the help of the spreadsheet, I put together a trip plan: I would leave from work in Trail, travel up to Rossland and charge at Level 2 to 100%, then continue on to Grand Forks where I would camp for the night and charge the car at Level 1 rates. The next morning, once I reached 100%, I would continue to Osoyoos and charge at Level 2, then continue on to Kelowna. 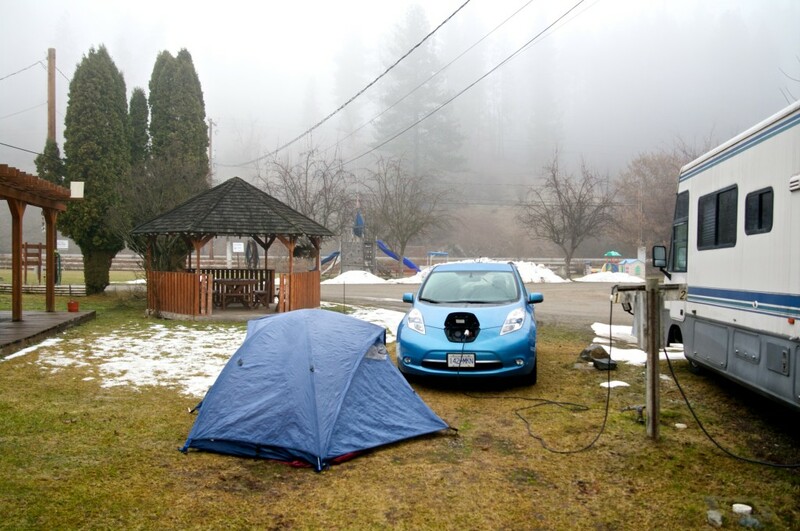 I would then do the reverse a few days later, stopping again in Osoyoos to fully charge, then spend the night at the same campground in Grand Forks. The next morning I would head to Rossland and charge for a few hours, before heading to work and finish topping up on Level 1, then to head home that night. Estimated average travelling speed, 70 km/h and 15.8 kWh energy consumed (for comparison, there are 8.9kWh in 1 L of gasoline); actual speed was close to 70 km/h for most of the climbs and I used 14.6 kWh of energy; I did use heat at a rate of about 250W (I usually wear a sweater, toque and gloves in the winter [even commuting by gasoline vehicle], so in the Leaf I only run the heater on the lowest fan speed and lowest temperature setting, then use the wonderful heated seat and steering wheel to keep me plenty toasty). 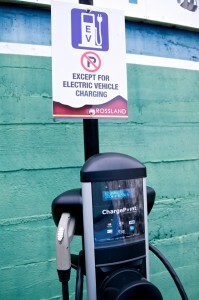 Rossland Chargepoint station. Boy winter wheels are ugly, looking forward to summer and the regular wheels! This station requires a credit card or fob to access, but no charge to use it. Notice I am pulling 6.5kW. Back on the main highway, I had more traffic to contend with; cars and light-trucks have an easy time getting around me at 70km/h in a 90km/h zone, but transport trucks are another matter, so I was really on the lookout for the big guys and got out of their way whenever I spotted one on the way up to the Paulson Summit (1,540m). From here I cruised quite easily down to Christina Lake (490m) and regenerated 7% on the way. I arrived in Grand Forks at 20:45 and arrived with 54% of my battery. Obviously I could have driven much faster and still arrived with battery to spare; however, Grand Forks does not yet have any Level 2 or 3 charging facilities, which meant I was stuck charging at a regular 110V/15A circuit, using the Level 1 “trickle charger” that comes with the car. The most it can draw from the wall is 12A (1.4 kW), and after using some of that energy as “overhead” to maintain the charging process, the car only puts about 1 – 1.1 kW into the car at best. I find that this value is typically closer to 1 kW, so in one hour of charging, I get 1 kWh (about 5% of the battery). To put that in perspective, in regular winter driving to/from work, 1 kWh only gets me a distance of a little over 6 km!! Over the course of this trip, I averaged about 8 km/kWh, so one hour of charging got me 8 km further down the road. Given that the increase in energy use is substantial as you go faster, it is actually much shorter for total trip time (including charging) if one drives much slower. That explains why I drove slower. This is also true of charging at Level 2 rates (even at 6kW, more on this in Part 2), but it is very pronounced for Level 1 charging. It took me about 20 minutes longer to drive at 70 instead of 90, but it saved me about 3 hours in charging time! I woke up in the morning, took a few photos, and by the time I had eaten and collapsed the tent, the car was fully charged and ready to go! 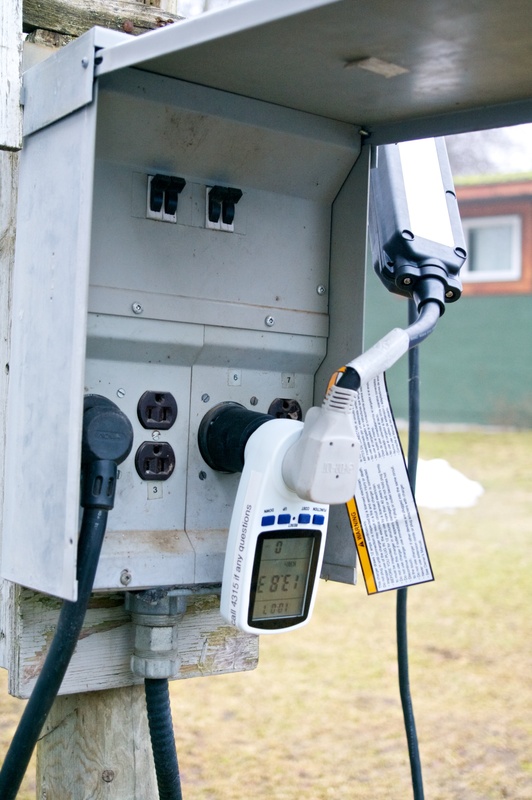 Campgrounds have a range of plug outlets; pictured here are regular NEMA 5/15 household outlets, and a TT-30 (120V/30A) that I am using via an adapter. The device with the screen measures how much energy I pulled ‘from the wall’.